If you would like to spend more time creating activities rather than organizing your flexible groups on your team, your in the right place. 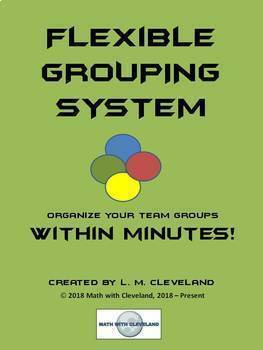 This product will allow your team to create your flex groups within minutes. An individual teacher can also use this system to create classroom groups. NO MORE CARDS TO ORGANIZE GROUPS! 1. The system takes less than 10 minutes to complete the initial setup. 2. Each teacher will take less than 2 minutes to set their groups. **This system allows each team to change their groups weekly or even daily. ** The changes only take less than 2 minutes per teacher! Once you setup the system, each teacher will receive a homeroom roster detailing were each student will go during flex group time. Each teacher will also receive a roster of their flex groups so they can take attendance and notes on student success.